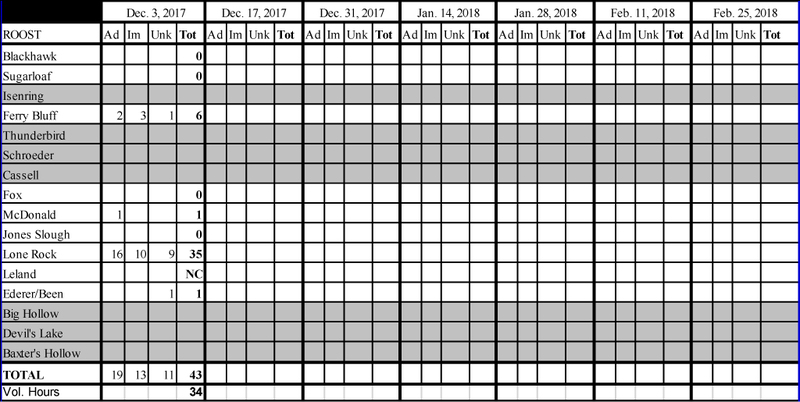 On December 3,2017 you collectively tallied 43 eagles through 34 volunteer hours invested (Table 1). This was our first count of the winter season and it might well have been the balmiest count ever! Unfortunately, warm afternoons and evenings make for less discerning eagle roosting behavior. From our radio-tracking data eagles tended to perch in trees near their feeding site rather than fly back to communal roosts when the temperature was above freezing at night. Resurgence of below-freezing nights would bring a resumption of communal roosting behavior in traditional roost locations. Our counts, however, are predicated on eagles utilizing their communal roosts so warm nights bring fuzzy data. This evening, counters at Black Hawk, Ferry Bluff, Fox, Lone Rock and Ederer/Been roosts all reported seeing some eagles that did not fly into the normal roost locations. As you might expect, with no ice on the river, most roosting eagles were concentrated downriver at the Lone Rock Roost. Ferry Bluff hosted the next largest group of eagles. It is typical that eagles avoid (or at least do not use) the upriver areas until ice removes down river habitat through ice and snow accumulation. Ferry Bluff roost, however, is used by eagles when birds are primarily distributed down river (as now) as well as when birds are distributed upriver, when extensive areas of river are iced up. Thus, though not always hosting the largest concentration of eagles, Ferry Bluff is a heavily used roost. Ferry Bluff is also the only roost that is extensively protected publically for eagle use. I want to provide a special thanks to Nate Fayram of Wisconsin Department of Natural Resources (WI DNR) who came out with Joe Howard to count from the south side of the Wisconsin River, across from Ferry Bluff. As many of you know, that portion of the Mazomanie Unit is closed for now and WI DNR staff have been very cooperative to chaperone us on counts. In addition to DNR assistance, we added a third count location for Ferry Bluff to determine if, or how much, eagles may use the bowl immediately west of the current roost location. This count site is located at the end of Huerth Road (Figure 1). The bowl that is counted from Huerth road is adjacent to property that is for sale. 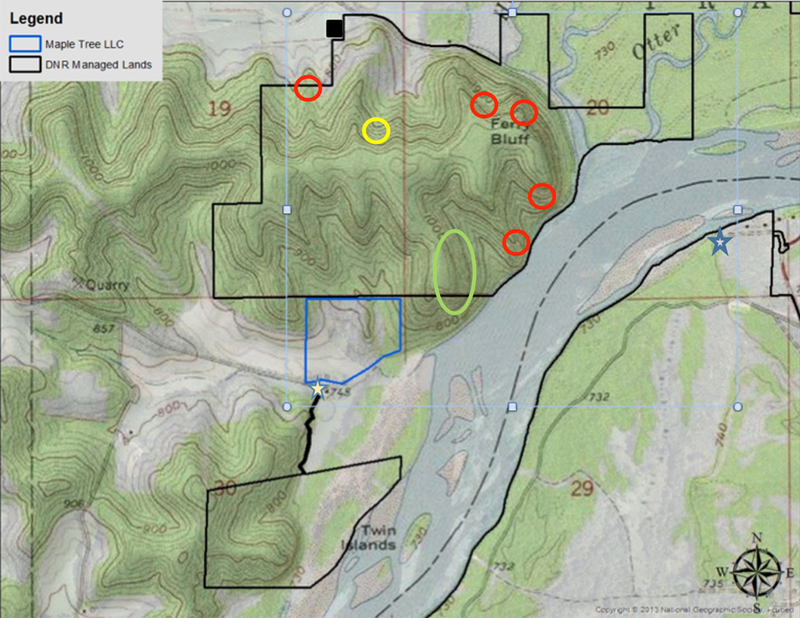 Finally, a 31.42-acre parcel is for sale that is adjacent to Ferry Bluff State Natural Area (Figure 1). The WI DNR would very much like to add this parcel to the Ferry Bluff State Natural Area but cannot purchase any land right now. The land has been appraised for $159,100 by a DNR-approved appraiser and Groundswell Wisconsin (formerly Dane County Natural Heritage Land Trust) is willing to arrange for the purchase, transfer to DNR and Stewardship Application for $80,000. 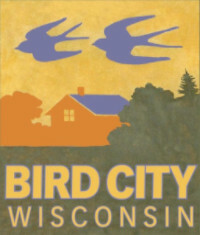 Ferry Bluff Eagle Council has been asked to help purchase this parcel for donation to WI DNR. On November 29, 2017, Ferry Bluff Eagle Council Board approved a motion to raise up to $80,000 towards this purchase of critical land for eagles and the council donated the first $5,000 towards this purchase. We only have $75,000 left to raise! Though the land has not been used extensively by roosting eagles (Figure 2), it has great potential as a communal eagle roost. Note the large shift of eagles from roosting on the north aspect of Ferry Bluff State Natural Area from Radio-tracking data (Figure 2) to the current use of Ferry Bluff State Natural Area (Figure 1). Eagles have shifted use of areas within the natural area and could well need to shift their use again. Having multiple bowls with good perching trees is essential for this high-use roost. The second value in this purchase is that, under private ownership, people could walk right up to the back side of the presently used roost (Figure 1) and substantially disturb roosting eagles. Such disturbance has been prevented by the current landowner but that guarantee would not necessarily followto new private owners. I believe that this parcel is critical to the future of eagles roosting at Ferry Bluff and that Ferry Bluff is still a critical area for wintering eagles in the Lower Wisconsin River. We would not have the ability to make such a strong statement without the contributions that all of you have made in counting these birds year in and year out. Now is a critical time to make an additional commitment to this eagle resource. Would you please consider giving whatever amount that you can afford? Your consideration of this request is most appreciated. If you can give, please make check or money orders out to Ferry Bluff Eagle Council and put Ferry Bluff Fund in the memo. 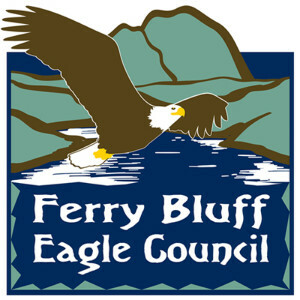 Send your contribution to: Ferry Bluff Eagle Council, P.O. Box 532, Sauk City, WI 53583. Your contribution is tax deductible. Table 1. Coordinated roost count results for the winter of 2017/2018 by roost. Grey-filled lines are inactive roosts that are not currently monitored. (Click image for enlargement). Figure 1. Red = minor roost locations, green = major roost location, yellow = previous major roost location (not used as much in last decade), black square = house location built about 10 years ago, black line = DNR boundaries, blue = parcel desired for purchase. Stars are count locations for winter 2017/2018. Actual location of northern-most star is at pullout on Highway 60. (Click image for enlargement). Figure 2. 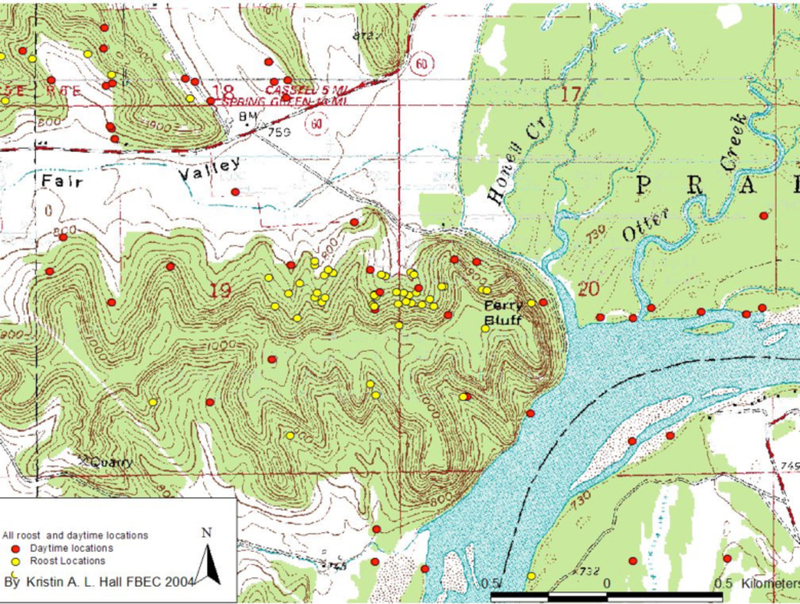 Locations of eagles tracked with radio transmitters in the Ferry Bluff Roost Area 2000-2004. (Click image for enlargement).